Early in December we danced at Keynsham on a club night but due to babysitting duties we couldn’t make their Christmas party dance. We did attend the Culm Valley Merrymakers Christmas party dance at Ash Thomas it was a good evening with dancing, games, prizes and a bring share supper. Later in the month, having tried to get to a Monday club dance at Normandy for about six weeks, we eventually got there on the 19th December. Nigel and Hilary were running the dance as Joyce and Richard were on holiday and despite being dressed in a suit covered in Snowmen, Nigel insisted it was not a Christmas dance but a serious afternoon of Old Time Dancing. If you believe that, you will believe anything. There was a mix up at the start because Nigel had emailed us to say it would be an eclectic programme which Paul had read as electric!!! It was a varied programme and there were party dances. However, Nigel worked us hard, he taught the “Lambeth Walk” and we even danced the barn dance to the original script, no clapping and there were thirds, glissades and glides (who would have thought it). A great afternoon we thoroughly enjoyed it. ​Our friend Michelle Boddy celebrated her 70th Birthday in November. The celebrations started in London with her family and carried on at various dance clubs throughout the month and culminated in a Charity Tea Dance in Lincoln on 27th November. Old Time Dancing friends attended along with Michelle’s family and dancing friends from Lincoln to help her finish off the month long celebrations. Michelle had prepared a lovely afternoon tea including a three tiered birthday cake. The dance programme was mostly Old Time and Michelle led off each dance with different leaders from around the country. After the sherry toast Michelle was surprised by a presentation of two birthday cakes by her family one was a butterfly cake made by her grandchildren that was covered in lots of lovely sweats. It was a charity dance and Michelle, who had asked for no birthday gifts, asked for donations to the three charity’s she was supporting. Michelle was thanked, by Grahame Baldwin Chairman of The Old Time Dance Society, for all she does for Old Time Dancing in Lincoln and throughout the country. Everyone enjoyed the afternoon, however, along with all the fun and laughter there was sadness because Dot Allen from Leicester had passed away only two weeks before on Michelle’s actual birthday. We all miss Dot and our thoughts are with Ken and her family at this sad time. We had beautiful Autumn sunshine for the drive to the Langstone Cliff Hotel, Dawlish for our dancing holiday. As we had over 90 booked in we took the opportunity to travel a day earlier to prepare. This meant we could settle in and get everything sorted out before greeting our guests on Monday. Everyone soon settled in and there was chatting and laughter as friends met up and new acquaintances were made. We were surprised and delighted when we received the first deposits for next year’s holiday before the evening’s entertainment started. Following the drinks reception and excellent evening meal, the first evenings dancing got underway with the Heather Waltz. 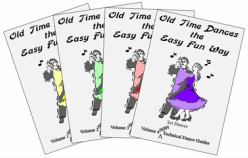 We had three full nights of Old Time Dancing with set dances, a few newer classical dances and some fun dances which everyone enjoyed dancing or watching. As well as the dancing we had some fun and party games for prizes, spot and lucky dip prizes. On the second evening there was a raffle and the elimination dance, for a bottle of whisky, which was led by Bath Old Time Dancers formation team. On the final evening we had a black and red card night theme, everyone joined in with the spirit of the evening. There were four games of Play your card night (very similar to play your cards right) with lots of prizes to win. Paul couldn’t find any dolly dealers so he had two doggy dealers to help him Sue Hamm and Anne Roberts. Each evening we had Margaret and Clive’s fun dance; The Blaydon Races, Dashing White Sargent and the Teapot dance. On the Tuesday morning there was a social dancing morning session with a programme made up from requests, these included Ballroom dances, Old Time and older sequence dances and a line dance. Bernice and Grahame showed a party dance the White Heather Foxtrot, which is danced to polka music and Margaret and Clive, went through the Victorian Gavotte that was on the programme for Tuesday evening, as some of the dancers were not sure of it. Refreshments were served at the end of the social dance morning. 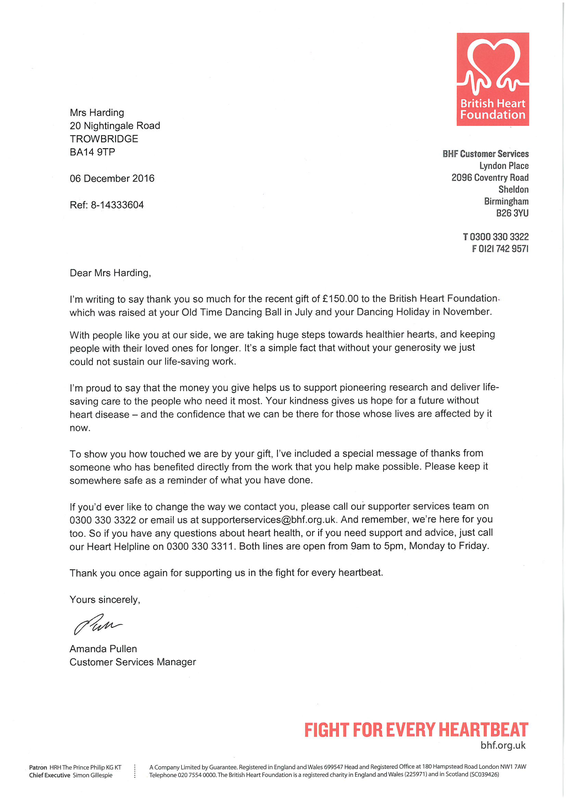 During the three days we held a competition for a wine rack full of wine in support of The British Heart Foundation, to win the prize dancers had to guess the amount of money in a jar. We donated the money in the jar and the money raised from those participating in the game and added this to the money raised at the Bath Summer Ball which gave us a total raised of £150.00. The winner was picked after the interval on the last evening and much to her surprise Betty Maller was the lucky winner. It was a pleasure to host the holiday with such a friendly crowd who all joined in, helped and encouraged newer dancers to enjoy the dancing and create such a good atmosphere. After the dancing each evening many of us got together to socialise over a drink and supper and knowing Nigel’s love of all things crumble, Clare Lodge presented him with an apple crumble cake and even brought tubs of custard, Nigel kindly shared this amongst the group. We are already planning next year’s holiday which is now sold out but taking names for the waiting list. We would like to take this opportunity to thank Nigel Carter for taking lots of lovely photographs. A large group of dancers from Bath Old Time Dancers attended and enjoyed The Old Time Dance Society Weekend in Weymouth. We were leading on the Friday night so it was good to have a lot of our group with us and although a little nervous we soon started to enjoy the evening because we knew we were among friends not only the Bath Dancers but members from all over the country. We received a lot of support from everyone. We would especially like to thank Phillip Randles for his music he played a lot of our favourite tunes and his beautiful music carried us along. We were delighted that, our friend, Brian Webber from Dorchester surprised us by attending the Saturday and Sunday Night dances and he even wore a bow tie on the Saturday. Brian enjoyed the event and also dancing with, in his words “the friendly group”. Brian was accompanied by Jean from the Dorchester club on Saturday. It was also nice to dance with Peter Bickell who was able to join us on the Sunday. The whole weekend was successful with Bernice and Grahame leading on Saturday and June and Ron on Sunday. Bernice did a great job organising the event and even ordered warm and sunny weather. On Saturday 16 July, The Southern Ball, a traditional and Classical Old Time dancing event, was held for the 2nd year running in the magnificent Guildhall, Winchester. Over 90 dancers enjoyed the programme of 22 Old time dances that included a scattering of classical sequence dances and a set dance, “The Lancers”. Once again this year dancers from the Southwest to the Southeast were joined by dancers from Yorkshire, Lancashire, Leicester and Lincolnshire to enjoy traditional Old Time Dancing. The evening started with the French National Anthem and dancers stood in respect to show their support for the people of France, following the tragic loss of life in Nice on the 14 July. Holbrook dance shoes attended and many of those attending the dance took the opportunity to increase their dance shoe collection. We very were pleased to have the wonderful music of David Last, again this year and the leading was shared between Hazel and Paul Harding, Joyce Hutchins and Richard Purcell, Hilary and Nigel Carter and Dianne and Terry Harris. Paul welcomed everyone to the ball and introduced Joyce and Richard as MCs for the evening. The stage was decorated with two magnificent flower displays provided by Hilary. Nigel captured highlights of the evening on film taking photographs and Dianne and Terry had organised a raffle with over 40 prizes. It was a joy to see the ballroom filled with old time dancing friends enjoying the dancing and the superb music of David Last, in a friendly relaxed atmosphere. We are also grateful for the support of Maestro Music. At the end of the evening Paul thanked everyone for their support, he said, although we organise and run the ball we couldn’t do it without the help of Joyce, Richard, Hilary, Nigel, Dianne and Terry and of course without the support of all the dancers. The house was full for the Tea Dance at Normandy hosted by Summer Time Dancing. A large number of dancers who had travelled to Winchester for the ball stayed over to attend the post ball tea dance, along with Summertime members, on a lovely sunny afternoon. We all enjoyed another full programme of Old Time Dancing and sang along to the music of Antonair. Summertime dancers provided a lovely afternoon tea including a huge range of delicious cakes and Paul’s favourite, Joyce’s cheese scones. It looks as though both the Southern Ball and Summertime Tea Dance are set to continue due to the large number of bookings already received for next year. Contact Paul or Joyce to book your place for next year. July - 2016 Our monthly Bath dance on the 8th July was well attended, we had two new dancers and Clare and Ann from Stroud kindly provided cakes for the dancers to enjoy. The following day we travelled with Dianne and Terry to meet up with friends at Normandy for the Summertime dance. Joyce and Richard had arranged another excellent evening of Old Time Dancing and Richard kept us all amused with funny topical jokes and anecdotes. ​​For Summertime report and pictures click here. The following weekend it was time for the Southern Ball again (where did that year go) full report on the Southern Ball above. We travelled back on Sunday evening and repacked the car with our luggage for Bernice and Grahame’s Holiday the next day!!!! The journey up to Morecombe, for the holiday, was not good for us due to road works and an overturned caravan on the M6. However, we had a wonderful holiday with 4 days of dancing at the Headway hotel Morecombe and while we were there, summer arrived with intensity. Bernice and Grahame produced a party atmosphere on all four evenings of dancing with much fun and banter among the friendly group. On the fancy dress evening the theme was “book titles” and many of the group put a lot of effort into their costumes. The music for the holiday was Charles Brown, we had not danced to him before and he had not played for old time for 11 years. We thoroughly enjoyed his relaxed style and lovely tunes he played, he used quite a lot of original music and joined in with the fun. We look forward to dancing to him again and send our thanks to Bernice and Grahame for a great holiday. With dancing at Keynsham and Dorchester July was a busy month of dancing. June - 2016 at the beginning of June we attended Summertime Dancing for the now annual Bryan Smith Tea Dance at Normandy. This is a traditional old time dance hosted by Joyce & Richard and the music is all from Bryan Smith’s vinyl records. Always a good afternoon and this year was no exception and we had the usual Surrey sunshine. We had a visit to Culm Valley dancers for their last dance before the summer break. At the end of June having sold our house and spent the two weeks, after the Bath Summer Ball, packing everything up and putting everything in storage we were glad to have a break and visit Michelle in Lincoln, for her Strawberry Dance. It was a great evening and as usual Michelle produced a party atmosphere along with a great evening of Old Time Dancing. Michelle had support from old time dance society members and local dancers, who included ballroom, social and line dancers. Michelle encouraged them to join in with the old time dancing and the Lancers and I have to say we had the most fun we have ever had in a set dance. Michelle produced a Ham salad buffet supper with all the trimmings finished off with huge bowls of strawberries. The following day we took the opportunity to visit Kath and Keith in Sheffield and enjoyed a lovely afternoon of Old Time and Classical dancing. As well as a full programme of traditional Old Time dances Kath and Keith included a couple of classical sequence dances: the Lola Gavotte and the Evening Star Saunter which they taught. We thoroughly enjoyed the programme and afternoon and it was great to meet up with friends and renew acquaintances. We are grateful to Kath and Keith for taking the time to teach a dance. Thanks to Michelle, Kath and Keith for a great weekend of Old Time Dancing we are only sorry we do not live nearer to be able to attend more often. Back to the packing we move out on 1st July and as our new house is not ready we will be homeless, moving in with our daughter temporarily so it will be payback time. Bath Old Time Dancers held their Summer Ball on Saturday 11th June. To celebrate the Queens 90th Birthday, there was a red white and blue street party theme. The room was decorated with Union Jack bunting and almost 80 dancers from as far as Cornwall to Hull attended the traditional Old Time dancing ball, many dressed in red white and blue. There was a full programme of Old Time Dancing to the fabulous music of David Last. After over an hour of dancing the room was filled with tables adorned with flags for the street party supper, which we prepared with the help of Sue Hamm, Michelle Boddy, Dianne and Terry. With a delicious range of cakes provided by Clare Lodge we had a street party supper fit for a Queen. At the end of the meal before returning to the floor to continue dancing the dancers raised their glasses in a toast to the Queen, wishing her a happy Birthday. Later in the evening a parade of extravagant royal themed hats were worn by willing contestants with a winner for both the ladies and gents. There was a large royal themed raffle and a separate draw for a family ticket to the Roman Baths, Costume Museum and Victoria Art Gallery that raised £65 for the British Heart Foundation. We had a fantastic night of dancing and were delighted to be joined by so many dancers from Bath and across the country. The evening finished with Auld Lang Syne and a rousing chorus of Land of Hope and Glory before the National Anthem. Next year our Summer Ball will be held on 10th June 2017. We are now looking forward to The Southern Ball on 16th July the largest Old Time Dancing annual event in the South of England. We had been looking forward to the Old Time Dance Society Spring weekend at Torquay and staying at the TLH Hotel Victoria, a hotel we personally had not stayed at and we were not disappointed. The four day break was excellent with a friendly atmosphere, what a difference a year makes, everyone gelling together and enjoying the Easter break. The facilities in the hotel were excellent and although the four hotels appeared to be full, we were still able to enjoy that unique atmosphere when Old Time Dancers gather to enjoy dancing together. Good job the organisers ignored those who thought that holding the break at Easter would not be a good idea. The weather could have been better but we seemed to avoid the excesses of Storm Katie. Most people got out and about and having been blown along the seafront, after a break for a coffee, Paul told us to follow him as he knew a quicker way back, I wasn’t sure but others in the group trusted him and followed him in a large circle back to where we had started!!! Fortunately we met up with another group who did know a quicker way back and we followed them. The pound shop did a roaring trade in Bunny ears and a large group of dancers wore them on Easter Sunday morning, there was an excellent raffle, spot prizes, Easter Bonnets and not to mention tassels. Obviously the main objective of the weekend was Old Time Dancing and the four day break with two morning sessions, (a wet weather morning and a teaching morning), gave us the opportunity to enjoy over a hundred dances. The leaders for the four day break were Hilary & Nigel on the Friday, Joyce & Richard on Saturday, Joy & Wendy on Sunday and the Committee and weekend leaders on Monday with Richard as MC for the evening. The programme for Monday was chosen by the dancers who put in requests. The leaders all shone and led wonderful dance programmes all bringing their own style on each evening. All accompanied by the fantastic music of David Last. We led the Ascot Gavotte on the Request Evening and would like to thank David who took the time over the holiday to hand write out the music for his arrangement of the Music for the Ascot Gavotte. To summarise we enjoyed a brilliant four days of lovely Old Time Dancing to fabulous music in friendly company and came home smiling. January 2016 - got off to a good start with a visit to Ash Thomas in Devon on the 5th of January for their club night. Jean and David were unwell but Sheila stepped in and with the help of all the dancers we enjoyed a very good evening. We had another good evening at our January dance, we had 27 despite the fact that many of the regular dancers were on Joyce & Richard's Dancing holiday in Bournemouth. We set off for the holiday in the early hours of Saturday morning having put all the gear away after the dance and re-packed the car with our luggage. We had a good time on the holiday as we always do with Joyce and Richard. Their January holiday next year is at the Marsham Court Hotel, Bournemouth, see details on our dancing holiday page. There was a full house at Keynsham for the Saturday dance on the 23rd, a good atmosphere and plenty of dancing making another enjoyable evening. Last but not least on Friday 29th we journeyed to Dorchester for a fun evening of Old Time Dancing with Brian Webber.